Are you looking for a way to put some fright into your Halloween night? How about a flying bat circling around the heads of your guests? Armed with only a multimeter and couple of short lengths of wire, you can easily transform the WowWee FlyTech Dragonfly into a frightening dive-bombing bat—sans remote control. Yes, you can leave the radio control transmitter at home (except for recharging the bat’s internal LiPoly battery), because this bat takes to wing on its own terms. Step 1. 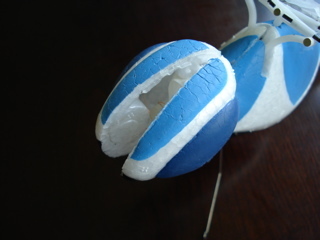 Carefully separate the Dragonfly’s two foam body halves. 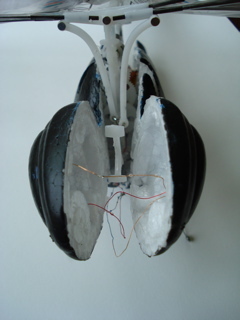 One blue “eye” LEDs has been glued into each one of these foam halves. 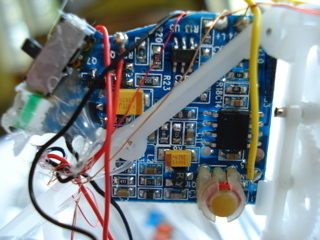 You can elect to leave these LEDs intact, remove them, or swap them out with a pair of red LEDs. I elected to remove them—for conserving battery power. Step 2. 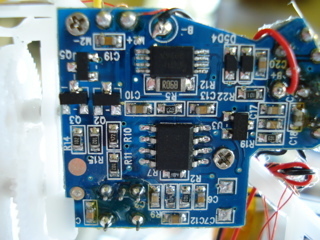 Use your multimeter to identify the main motor’s positive (+) and negative (-) connection points on the Dragonfly’s printed circuit board (PCB). These points should be labeled M+ and M- (or, M1+ and M1-), respectively. You might have to “unearth” the M- connection point from under a mound of glue gunk. Step 3. 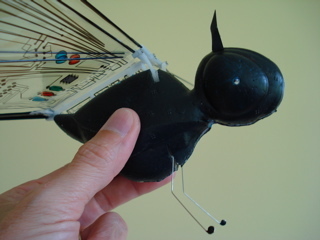 Locate the ON positive (+) terminal and the ON negative (-) terminal on the Dragonfly’s power switch. Double-check that these terminals are in the ON position and not the OFF position on the switch. Step 4. Solder a wire from the motor’s M+ connection point to the switch’s ON + terminal. Solder another wire from the motor’s M- connection point to the switch’s ON - terminal. Step 5. Test the switch’s operation. When you flick it ON, you should receive full power wing flapping from the Dragonfly. Your bat is almost ready to take flight. You can switch the power OFF. Step 6. Align the two foam body halves and glue them back together. Ensure that the gears and armatures move freely. Paint the foam body and tail flat black. Fashion two bat ears from the scrap paper and glue them into place. Step 7. Switch the bat ON and launch it into flight. You should strive for a circular flight path. 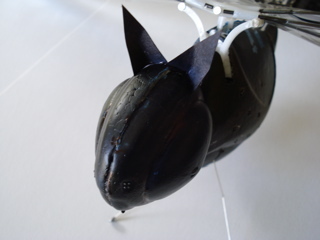 Try twisting the entire tail assembly to obtain the desired flight path.